Having extreme issues with your browser? Many people know the annoyance of having a browser slowly grind to a crawl over time. The speedy experience you had at first eventually becomes a distant memory. Whether you’re sick of dealing with annoying issues in Chrome 10 Annoying Chrome Issues and How to Fix Them 10 Annoying Chrome Issues and How to Fix Them If you are experiencing Chrome problems, you've come to the right place. In this article, we take a look at some of the most common flaws and provide guidance on how to fix them. Read More or find that Firefox is running slowly 5 Things to Do When Firefox Runs Slow but Other Browsers Run Fast 5 Things to Do When Firefox Runs Slow but Other Browsers Run Fast Firefox shouldn’t feel slow, particularly when compared to Opera and Internet Explorer. If it does, try these tips and see if you can restore it to its full glory. Read More , a reset can clear up those issues and return your browser to defaults. 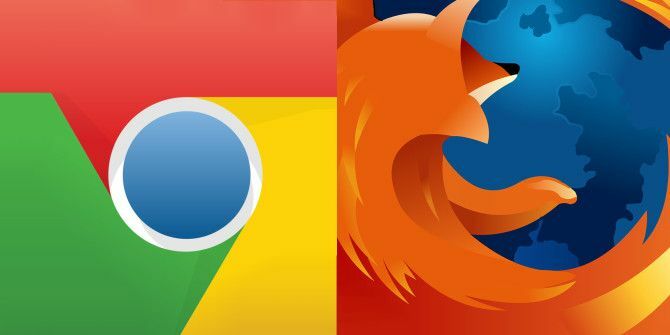 Here’s how to reset Chrome or Firefox. Open Chrome and click the three-dot Menu button in the upper-right. Choose Settings. Scroll down to the bottom of the Settings page and click Advanced to show more options. Next, scroll all the way down through the new options to find the Reset header. Click the Reset button and you’ll see the prompt. Hit the Reset button to reset your start and new tab pages, search engine, and pinned tabs. This also disables extensions and removes cookies, but won’t delete bookmarks, history, or saved passwords. Enter about:support in a new tab. This will open a page with technical information about your browser that’s useful for troubleshooting. You’ll see a Refresh Firefox button on the right side at the top of this page. Click it and confirm to close Firefox and perform a refresh. This refresh removes any installed add-ons, custom settings, search engines, download actions, and security certificate settings. It doesn’t remove your bookmarks, passwords, open windows, and similar info. If your issues persist after the reset, it’s a good idea to uninstall the browser from your PC and grab a fresh copy from the official sites. These resets aren’t terribly invasive, but they will remove a good number of settings from your browser. Before you proceed with them, make sure you’ve checked our tips in the articles above and have ruled out a network problem The Complete Windows Network Troubleshooting Guide The Complete Windows Network Troubleshooting Guide Got an internet or network issues? We'll guide you through your network setup and show you simple troubleshooting techniques to find and fix the problem. Read More . Explore more about: Google Chrome, Mozilla Firefox, Troubleshooting. Refresh Firefox sounds like a simple solution to FF problems. Yours is not the first article suggesting it. Unfortunately all articles are uniformly silent on how to restore the customizations and add-ons installed over years of FF usage. I have made dozens of changes to my about:config, most of which I cannot remember. I'm know I am not the only one. Before Mozilla gave us Quantum, saving FF settings was easy with FEBE. However, in their infinite wisdom, Mozilla made Quantum and FEBE incompatible. "If your issues persist after the reset, it’s a good idea to uninstall the browser from your PC and grab a fresh copy from the official sites." What is the difference between Refresh Firefox and a re-install of Firefox?